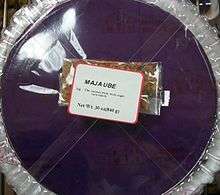 Maja de ube, a variant of maja blanca that uses ube (purple yam) resulting in a deep purple color. Maja blanca (Tagalog pronunciation: [ˈmaha ˈblaŋka] MAH-a-BLANK-a) is a Filipino dessert made primarily from coconut milk. Also known as coconut pudding, it is usually served during fiestas and during the holidays, especially Christmas. Maja blanca has the consistency of thick gelatine and a delicate flavor, and is creamy white in color. As the name suggests, the dessert is of Spanish origin, adapted from the traditional holiday dessert manjar blanco, and is thus related to other similar desserts such as blancmange. The name means "white delicacy". Maja blanca is also known as maja blanca con maíz, maja maíz, or maja blanca maíz when corn kernels are used in the preparation (maíz is Spanish for corn). Maja blanca is relatively easy to prepare. A coconut milk (not coconut cream) and cornstarch mixture is heated to boiling over a low flame while stirring. Agar (gulaman in Filipino) can be substituted for cornstarch. Corn kernels, milk, and sugar are also often added, though these are not traditionally part of the recipe. Once the mixture thickens, it is then poured into serving dishes previously greased with coconut oil and allowed to cool. Once firm, latik (browned coconut cream curds) are then sprinkled as toppings. It is also often refrigerated and served cold to improve the texture. Maja blanca can easily be adapted to include various other ingredients. Examples include squash maja blanca which uses calabazas (Filipino: kalabasa) and a version of maja maiz that uses butter, resulting in a distinctive yellow color. Another variation of maja blanca is the maja de ube (or maja ube). It uses ube (purple yam) as one of the primary ingredients giving it a characteristic deep violet color. 1 2 "Maja Blanca". Driftless Appetite: Life & Food in the Driftless Area. Retrieved November 26, 2011. 1 2 Reynaldo G. Alejandro & Doreen G. Fernandez (1998). Food of the Philippines. Tuttle Publishing. p. 102. ISBN 978-962-593-245-3. ↑ Vanjo Merano (November 8, 2009). "Maja Blanca". Panlasang Pinoy. Retrieved July 4, 2011. ↑ J. Dagoon (2005). Home Economics Technology IV. Rex Bookstore, Inc. p. 89. ISBN 978-971-23-4221-9. ↑ Regional Field Unit No. 5. Emily B. Bordado, ed. Vegetable-based recipes (PDF). Department of Agriculture, Republic of the Philippines. p. 11. ↑ "Maja Maiz". Home Cooking Rocks!. July 30, 2004. Retrieved July 4, 2011. ↑ Dagoon; et al. (1999). Culinary Arts I. Rex Bookstore, Inc. p. 269. ISBN 978-971-23-2603-5.